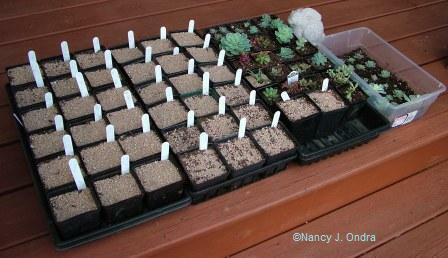 February is one of my least favorite months, but it does have one thing going for it: the start of seed-sowing season. The fun actually starts right after Christmas, with glorious hours immersed in the current crop of seed catalogs and seed-exchange lists, followed by a frenzy of making my own lists, fine-tuning choices, and placing the orders. Then, there’s the wait for the seeds to arrive. At the beginning of February, I can sit down with the big pile of colorful packets and sort them into two piles: those that must (or can) be sown immediately and set outdoors, and those that can wait a bit. At the top of this entry are a couple of flats of sown seeds awaiting watering, along with some echeverias and other succulents I’m in the process of rooting. 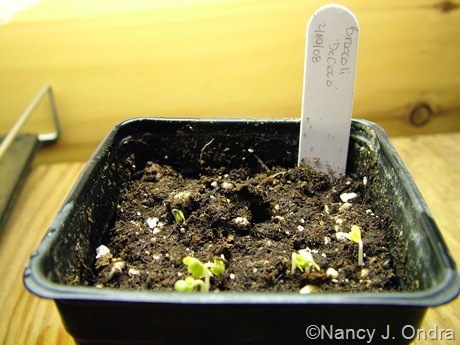 The succulents, of course, need to stay indoors until there’s no danger of frost, but these seeds will stay outside. I’ve experimented with several kinds of cold frames over the past few years, but this simple lean-to structure (a Rion MLT3 Mini Lean-To Greenhouse) continues to beat all the others I’ve had. I see it’s gotten two lousy reviews on Amazon, but I don’t think it looks all that bad, and it has held up well for me. I have it set up on my porch, atop a box-like stand that Mom built for it, and it’s placed over a window, so I can see into the structure from indoors. Inside the cold frame/greenhouse are three levels: two shelves, and then the base it’s sitting on. The bottom of mine is filled with potted hellebores, and the two shelves mostly hold seed pots, at least for now. By late March, the hellebores and seed pots get moved out to the porch floor, and indoor-sown seedlings get moved in to start hardening off. I can open my living-room window a bit to let in some warmth at that point, if needed. But for now, it’s mighty cold in there. Once the outdoor batch of seeds are settled in and chilling, it’s time to get the warmth-loving seeds going. The first step is sorting the remaining packets into six piles: one to sow right away; one for late February (about 10 weeks before the last frost date); one for mid- to late March (6 to 8 weeks before last frost); and one for mid-April (4 weeks before the last frost). The two remaining piles are for outdoor sowing: one for mid-April (mostly hardy annuals and early veggies), and one for after May 15 (mostly beans, squash, and other summer veggies). I sowed the “immediate” batch a few days ago: onions, leeks, broccoli, and several kinds of agastaches, along with a few hardy perennials. I dusted off the seed-starting stand in my front room, plugged in one light and the heating mat, and put the seeds in place. It’s not a fancy setup, but it works. Now, the very best part: checking several times a day to see what has sprouted! If you looked closely at the seed pots at the very top of this entry, you may have noticed that they’re covered with pale, gritty-looking stuff. That’s my favorite new seed-starting helper. I’d heard about something called Turface that the rock-garden people swore by for their seed-starting, and they said they got it from Agway. Seems to me that when I asked for it the first time, I ended up getting something called Profile instead. 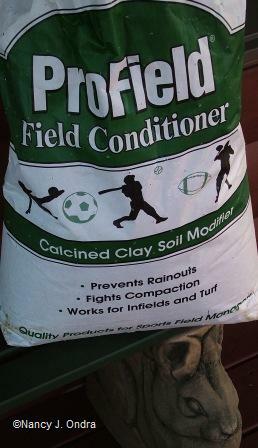 Now, when I ask for “you know, the stuff that used to be Turface,” this is what I get: ProField Field Conditioner. I don’t know for sure what’s up with the variety of trade names, but I do know that it seems like good stuff. It’s been fantastic for loosening up some of my veggie beds, and I also mix it with the ordinary ProMix BX that I use for all my seed-starting and potting, when I need to lighten up the peat-based mix a bit (for the succulents, for instance). I used to top the pots of my outdoor-sown seeds with aquarium gravel, but that got really expensive and seemed very wasteful. I did like the way it acted as a mini-mulch, though, to keep the surface from crusting over. ProField is much less expensive (about $10 for a 50-pound bag, if I remember correctly), and it works just as well. I also like to scatter it lightly over pots of surface-sown indoor seeds, to serve as a moisture indicator. 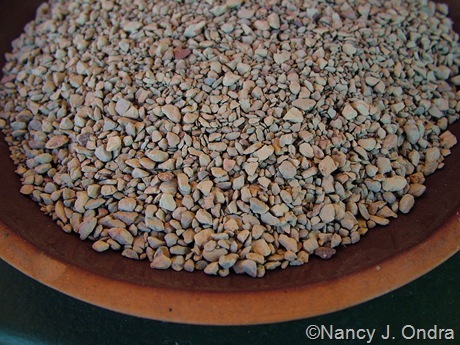 The cat-litter-like grit is pale when dry (as shown above) and dark when moist, so I know that when it starts to get light, I need to water immediately. Not being the most careful waterer in the world, I need all the hints I can get. I don’t bother with the top-dressing for easy seeds, such as veggies and most annuals; they’re fine without it. See, after just three days on the heating mat, the broccoli is already up and growing. That’s a really interesting tip about the calcined clay product. I used Profile long ago as a substitute for aquarium gravel in a planted aquarium. I think I got it at one of the big box home improvement stores. I may give it a try for seed starting, but I wonder if cheap old-style kitty litter would work the same way. Update: While poking around on Google, I found this page, which reminded me of the problem with cat litter. After it’s wet for a while, the litter turns into mush. Calcined clay is heated to much higher temperatures, so it’s much more stable. Wow, what a great sales pitch for the profield, now trying to find where I can get it around here. It looks like the chicken grit used for the first time this year that is quite pricey. I like you greenhouse of the porch, being able to see it from the window. Brilliant! I get mine through Agway; in your area, Frances, I think you may have Southern States instead? If not, you could ask at a feed mill that also sells stuff like lime, fertilizers, and grass seed. Or maybe your local golf course would know where you might find it, since I think it’s used for building greens too. If they don’t know the name ProField, don’t forget to try asking for Profile or Turface. Seeing this post makes me think I’m behind! I still need to order a few more seeds. That lean-to green house looks pretty useful. Enjoy the broccoli! Don’t worry, Dave: I don’t think I totally cleaned out the mail-order seed suppliers. Yet. This oughta be required reading, Nan–it’s one of the best posts/articles I’ve seen on starting seeds. I haven’t seen that greenhouse before, but I like the look of it (no cats can land on the shelves) and wonder if I can find something similar here in Nova Scotia. I’m going to go have a look and see what’s out there! Gee, thanks, Jodi. Yes, having the raised base and the sliding doors has provided excellent protection from mice, the neighbors’ kitties, and other critters who like to hang out on my porch as much as I do (in milder weather, anyway). I’m sure you can find some other simple lean-to structure, if not this exact one. Now, Elly, you can’t expect me to feel sorry for you not having *enough* room in your greenhouse. At least you *have* a greenhouse. And it’s a given that any greenhouse, not matter what size, is never big enough. Hope you can start sowing soon. I promise I’ll send the pokeweed seeds! Nan, this was a such great post. You’re so organized and neat with your seed sowing. 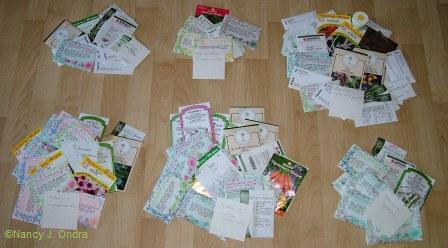 I need to go through and organize my seed packets to know when to sow too. 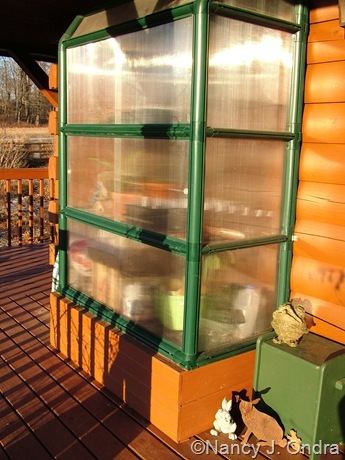 It is so windy here, I’m not sure I could use a greenhouse like yours, but I like it. Hi Robin! I enjoy being neat and organized with my seeds; with the rest of my stuff, not so much. I know what you mean about the worry of greenhouses + wind. It’s like Little House on the Prairie out here in the middle of this open field. Fortunately, Mom figured out how to attach the lean-to to the house, so as long as the house is here, the greenhouse is secure. Hi Nan! I just found this blog and man what a great post about seed starting! This is my first year with seeds and boy I’ve already made lots of mistakes. Gina! Great to see you here. I’m glad you found the info interesting. I’ve started seeds for over 20 years and still make lots of mistakes. My “best” one so far this year was plugging in the wrong heating mat, so my seeds stayed cold for days while I warmed the empty mat that was sitting on a different shelf. Then I wondered why they wouldn’t sprout. But you know what? Despite all of the detailed instuctions that make it seed-starting sound so complicated, the little things really want to grow, and they’re more forgiving than you’d think. Just keep trying! Nan: Great post on seed starting. Half the battle is finding a good place to put them where you can control the temp. a bit better. 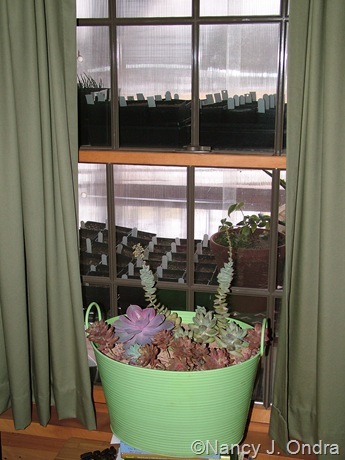 Love your ‘grit’ tips and since I have the same watering issues, will have to give that a try! Thanks, Layanee! If you do try the grit (either ProField or something else) yourself, please post about it on your blog. I’d be interested to hear what you think. Lots of good ideas in this post Nan. Thanks for passing them on. I like your little green house and how cool to have such a handy mom :) Do you grow any Hellebores in the ground as well as in pots? What are the seeds that you have out in the cold frame? Do you do any winter sowing or is this your version of it? Hi Kerri! Yes, I’m incredibly lucky to have such a mom; I don’t know what I’d do without her. And yep, I have lots of hellebores in the ground, too; the ones in the pots are those that usually have trouble overwintering in the ground here. The seeds in the cold frame are mostly perennials and annuals that require chilling or at least tolerate it. There’s also a flat of native wildflower, shrub, and tree seeds that a friend shared with me. I know the technique by the name cold stratification; as far as I can tell, it’s what others call “winter sowing.” If you’re dying to start planting, give it a try!